Atmospheric. Translucent. Radiant. Painterly. Chances are if you’ve ever applied these descriptive terms to an oil painting, you were looking at some of the effects scumbling can give you. Scumbling, a must-have technique in any oil painter’s bag of tricks, is where light layers of paint are dry brushed over darker layers. To understand scumbling, let’s take a look at some examples. In the above Rembrandt painting, scumbling is used to great effect, particularly in the hair and lighter features of the face. Rembrandt’s face glows and his hair seems to have a deep luster and shine that makes it look real. Meanwhile, Rembrandt’s eyes and a bit of his mouth have disappeared in an atmospheric haze. These effects are evidence of Rembrandt’s mastery of scumbling. Unlike glazing, which involves the repeated application of extremely thin translucent layers of paint and requires waiting for these layers to dry between applications, scumbling can yield effects rather quickly. By applying light-colored paint with little to no medium over a darker area, one can bring out highlights and textures in just one or two passes. Because scumbled passages are often a bit broken up and retain the brushstrokes, they allow some of the underpainting to show through. This is where the feeling of luminosity and radiance comes from. Scumbled passages are also good at bringing out the texture of canvas in particular. 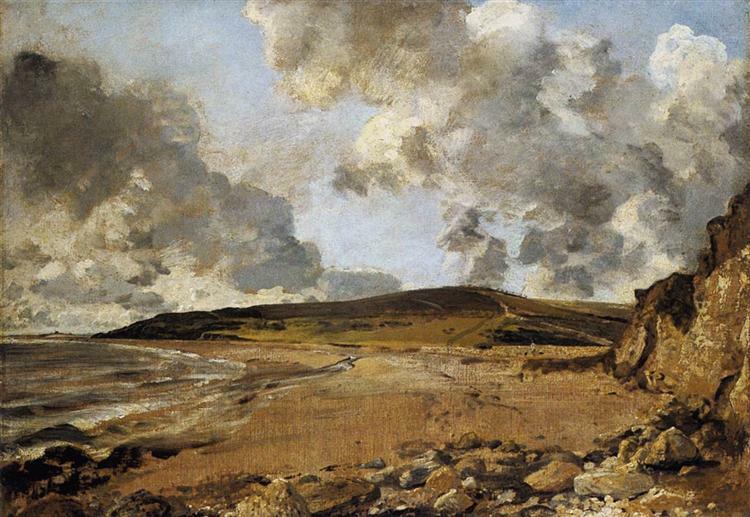 In Constable’s beautiful seascape, we can see how scumbled highlights along the beach reveal the texture of the canvas. Even more striking than the sand is Constable’s beautifully scumbled passage on the cliffs at the right. Constable’s seemingly arbitrary application of cream-colored strokes over the darker shapes of yellow ochre expertly mimic the textures of the rock, all while still showcasing the weave of the cotton canvas. Of course, Constable’s ragged clouds are scumbled as well. We even see the rare application of darker scumbling over light in those passages where tattered shreds of medium gray cloud have been applied over the blue of the sky. 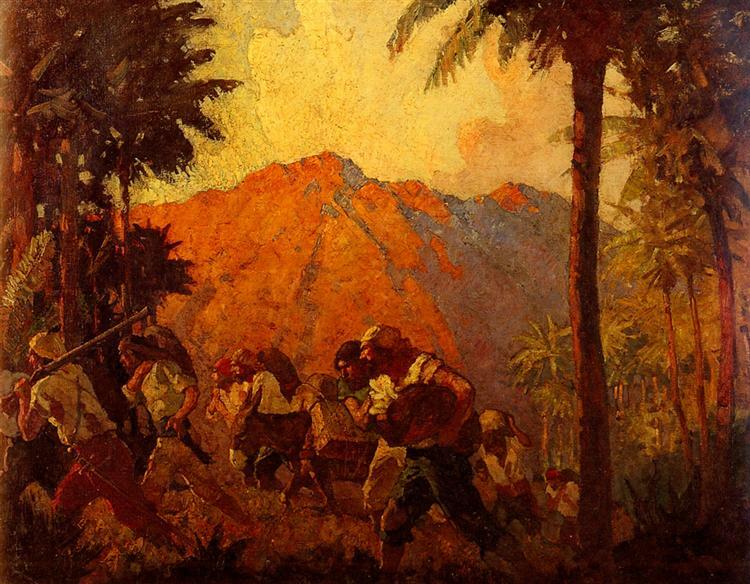 Few paintings better exemplify the radiance and atmosphere that scumbling is capable of delivering better than the above by illustrator N.C. Wyeth. The sky, the gaps in the fronds, the beautiful purple shadows in the mountains are all scumbled. Here Wyeth uses scumbling to its greatest effect to make everything satisfactorily solid and reinforce the quality of light falling on the figures and landscape. For all its power to create the illusion of three dimensions, there is something quite charming in the almost flat, graphic quality the landscape begins to take in Wyeth’s illustration. Even in contemporary painter Lucian Freud’s thick impasto painted surfaces, there is scumbling. 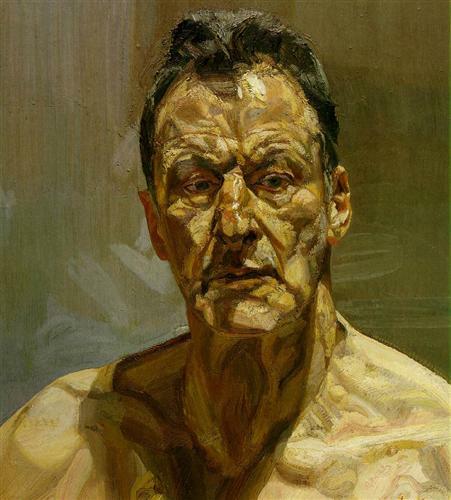 In his self portrait from 1985, scumbling reveals the form of wrinkles in the brow and cheek bones, and shows the texture of hair. It’s as though Freud painted his heavy textures first in darker colors, then used scumbling to reinforce the shapes emerging from the face. The highlights on the forehead, the ear on the right and the upper lip in particular use scumbling as a way to underscore volume. While Freud’s painting lacks the atmospheric haziness of Rembrandt’s self portrait, the sharp values and clarity of light in this image clearly shows the effectiveness of scumbling. Have you used scumbling before? What project will you try scumbling on next? I have been an oil painter for most of my life, but have not used scrumbling. I am going to try it on my next portrait. Nice technique. Oil paintings fascinate me a lot. I have seen lot of art work displayed by Peter Van Eupen and they were simply amazing! Peter Van Eupen’s paintings are abstract, done mostly in acrylic (an incomparable, inferior medium to oil) and have nothing to do with scumbling. They’re also a bit ####. I have used it before, but didn’t know it had a name.